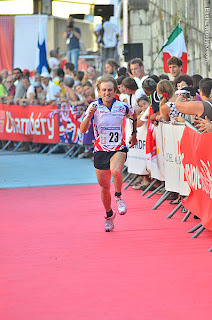 On Tuesday I achieved my best ever individual result in orienteering, finishing 4th in the World Orienteering Championships sprint distance in Chambery, France. I ran a safe qualification race in the morning, finishing 8th in my heat (with 15 to qualify), without exerting myself too much. In the final, I had a near perfect race, and paced it perfectly to pick up positions in the last few hundred meters to get myself into the top 6 for the first time. Apart from 2 bad route choices (to the 10th and 14th), where I lost a couple of seconds each time, I had a clean race with no mistakes or even real hesitations. I really enjoyed running through the crowded streets and narrow alleys, and I was able to push myself hard all the way. Many people have asked me if I am disappointed to miss out on a medal, but I am really happy to have performed to the best of my ability in a World Championships final and taken 4th place! The medal will just have to wait for now :). Here are my route choices. The result is especially satisfying as I have had a poor season due to several injuries, and I was not confident in my physical shape in the build up to the championships, but my preparations in the last weeks were good, training hard with my team mate Scott Fraser. He had a great chance to fight for a medal in the race, but was screwed over by a qualifier disqualification debate, only finding out he could even run the final less than an hour before the start, and then having to run through all the crowds as the marshals in the town didn't know he was running after the main start block. Today it was announced that the World Championships will he held in Scotland in 2015. This is really exciting news, and hopefully will provide a real boost for UK orienteering at a time when funding for sport (especially non-olympic) is being dramatically reduced. Details here. Hi Graham, today while I ran on the middle distance final track I found your number bib! if you don't need it I put it together other WOC souvenirs.